Since the beginning of race in mobile communication, a new model is being launched every day into the world with different features. These new features and specifications gain enough fame of users to survive in the competition of mobile technology. Today different manufacturers like Samsung, Apple, Sony, HTC and many more manufactures of smartphones and became competitors. One of the feature that attracts the mobile phone buyer is the smart work it does. Different types of sensors like accelerometer, ambient light sensor, GPS sensor, compass, proximity sensor, pressure sensor, gyroscope etc are behind these smartphones. Let us understand how each sensor works with respect to its operating principle. 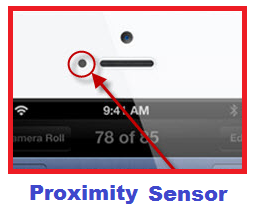 The main function of this proximity sensor is to detect how close your smartphone's screen is to your body. When you use your smartphone, it detects the position of ear with respect to screen and turns off the light of screen and saves battery. Also proximity sensor stops the accidental touch, unwanted input during talk. This sensor also detects the signal strength, interference sources and amplify or filter by use of Beam Forming Technique. Thus, in a nutshell, proximity sensor detect the presence of body like cheek, face or ear and stops the web surfing, music or video during talk/calling and save the battery. After the conversation, it resumes the same function which was stopped earlier during talk. GPS short form of Global Positioning System, originally developed and setup for military operations and was made available for everyone in 1980s by Government. GPS is a system which tracks the target or 'navigate' the things by map or picture with the help of GPS satellites. Nowadays smartphones come with assisted GPS or A-GPS which does the same work with the help of intermediate server in case of disconnection with main GPS satellite. iPhone 4S, iPhone 5, HTC One, HTC Droid DNA, HTC One X, Samsung Galaxy series smartphones, Sony Xperia, Nokia Lumia 620,820,920 and 822 and many more smartphones support GLONASS (Globalnaya Navigatsionnaya Sputnikovaya Sistema) GPS system for navigation purpose. 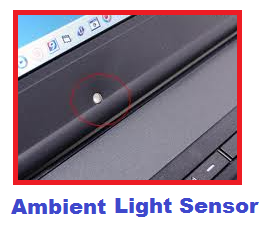 This sensor optimize the light of screen when it exposed to normal light with different intensity. Ultimate function of ambient light sensor is to adjust the display brightness, which at the end saves the battery power and life too. Ambient light sensor senses and adjust the light based on principle of "superposition". They contains photo diodes which are sensitive to different spectrum of light and combined mathematical effect adjusts the gain and output changes of the light intensity on the screen. The main function of accelerometer is to sense the changes in the orientation of smartphone with respect to datum and adjust the orientation to suits the viewing angle of operator. For example, when you are looking for web-page with increased width, you can get this landscape view from changing the orientation of phone to horizontal. Similarly camera mode also changes the portrait to landscape or landscape to portrait mode when we change the orientation of phone/camera. Ultimately this accelerometer sensor sense the change in orientation by 3D (X,Y & Z axis) measurement of acceleration of the device with respect to free fall. One can better use this feature/sensor while playing racing games where he/she can steer the car in the desired direction by leaning the phone in that direction. This sensor's function is to maintain and control the position, level or orientation based on the principle of angular momentum. 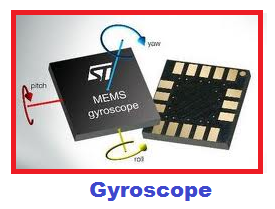 When 'Gyros' used along with accelerometer senses motion from six axes i.e. right, left, up, down, forward and backward. It also detects the roll, pitch and yaw motions. Yaw, Roll and Pitch are the angular moments seen from three axes i.e. X, Y and Z. Using MEMS(Micro Electrical and Mechanical System) technology, (iPhone 4 uses this technology) gyroscopic sensors helps in navigation purpose and detecting the gesture recognition systems used in smartphones and tablets. Back-illuminated sensor is one of the new feature that every camera contains. 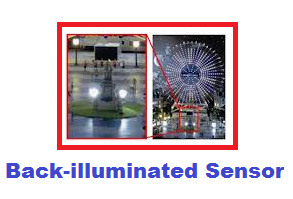 It is a type of digital image sensor which changes or increase the light captured while capturing a photograph. Earlier it was designed for security cameras and astronomical purposes. Sony is the first company to implement this technology in 2009. Thus, at the end, one can say all these sensors serve as the back-bone of recently developed smartphones and also Quick Response (QR)Code, Data Encryption and these smart sensors made our conventional phone become Smart. Thanks for sharing such a nice Information about sensors used in smartphones/tablets. I also hear about the sensors which used in cellphone for touch system and now i read full article for the details. your BSI interpritations is as far off the mark as can be. do more research. BSI is about photons coming through a pixel well on the back of the sensor module rather than through the transistors, gathering more photons, thus smaller pixels are a by-product, thinner module - 7mm instead of 10mm. Hey what about pressure sensor I was looking for? I am also interested in pressure sensors (for better altitude accuracy). What abt pressure sensor? Can you please update the article? Can you update the article about pressure sensors? 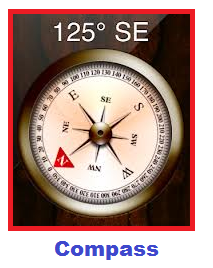 How can I find out how many mobile phones have the magnetic / compass sensor built in? There's a random "shiny" chip inside my tablet. I can identify every microchip on my motherboard except that one. It is not even close to the cameras, so I don't think it's an image sensor, but it looks very similar, just to give you an idea of its appearance. Can anyone give me a clue as to what it may be?